Last year's Valentines Day giveaway went so well, let's do another for Fathers Day 2011. Topps ran father and son subsets in 1976 and 1985 (the latter profiled at Trader Crack's Card Blog), connecting current players to formative years of watching their dads play 50s and 60s baseball. 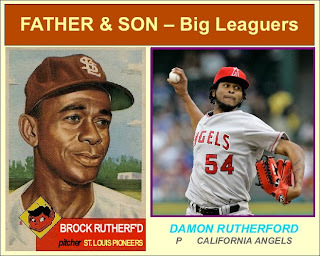 The combos don't provide many stars--only Yogi/Dale Berra come to mind--but did give collectors a look at sets that were hard to build prior to eBay. While an interesting enough concept on its own, this double-photo format's also a good subject for custom projects. The New Jersey baseball blog 11th and Washington published their 13-player update in late March, The Collective Mind did a 1976-style Chris/Justin Speier last year, and I made my own fictional version for a contest at Rain of Error. WHAT YOU WIN: I'll pick five winners from the entrants and send out cards from those teams. UPDATE: Entries accepted through Wednesday, June 22 and I'll pick winners on June 23. My father's favorite team is the Giants. After a bit of an odyssey on my part, my favorite team ended up being the Giants as well. I think my dad rooted/roots for the Giants because they have trained here in Arizona. Their AAA team was the Phoenix Giants for many years. I started out as a Reds fan. This was the era of the Big Red Machine. I got mad at the Reds for trading Tony Perez and letting Pete Rose go. I switched to the Phillies when Rose went there. The Giants were always my secondary team because of going to so many Phoenix Giants games. After Pete retired I ended up rooting for the Giants full time. This was the Roger Craig "humm-baby" era. This continued until the Barry Bonds era. I pulled for the Giants for his first few years, but when Arizona got the Diamondbacks I started rooting for them. This was mainly because it was getting much tougher to root for Bonds (grouchiness, roids). After Bonds left I went back to the Giants and have been there ever since. I'll link to your contest on my A Giant Blog. My fav team was the Astros and my parents as well. Neither of my parents,rest their souls,were huge sports fans.My Mother watched more baseball games than Dad though.He was always busy doing something.We were all Indian fans,probably because they are the closest team,and as you know I still am. (60 years later!) After my Dad passed away I found a 1949 Cleveland Indian program in a basement drawer.So he went to at least one game.I later had it autographed by Bob Feller! Both of my sons have followed suit and are Tribe fans too. I'm a Cubs fan like my father and his father before him. They both grew up in Central PA and have no idea why my grandfather followed the Cubs. The Lovable Losers have been passed down for 3 generations now and I am working on the 4th. I'll get a post up on my blog by tomorrow afternoon. Thanks for another cool contest! My Dad and I were/are both Phillies fans. Although he'll admit to rooting for the Yankees back during their glory days in the '50s. Well I'm a Braves guy. And I can thank Ted Turner and WTBS on satellite tv for a kid from northern British Columbia becoming a Braves fan. I am a Mets fan. I think my Dad was a Yankees fan but I am not sure. My dad was a coach who just enjoyed the game. I know my granddad was a Yankees fan. My brother's a Phillies fan. Strawberry and Gooden were too good to pass up back when I was a kid. whole fam damily are tiger fans. Well, having grown up in Pittsburgh in the 70's, I lived with a family who spent all day long singing "We Are Family" for the Pirates. I, of course, am an Indians fan. My grandfather in Pgh was probably the most disappointed. My favorite team is the Dodgers. My parents' favorite team is....the Dodgers. I shall pimp your contest in my post tomorrow. and as for me, my dad grew up a Yankees fan, but fell out of favor with them and MLB during the baseball strike, now he pretty much roots against them but mainly watches college ball. As for myself, both my mother and I were born in Philadelphia, and by our birthrights, are Phillies fans through and through. We have attended several Norfolk Tides games, living here in the Tidewater area, I love watching the Mudhens when they come to town. Thanks for a GReat contest. My parents' fave team: Braves I guess. Not real big sports fans. My Grandfather, Uncle, Cousin and especially Granmother's fave team: Braves. Grandmother's fave anything: Greg Maddux. Oh man how she loved the Mad dog. Also: blog alfhassedly pimped on my latest blog post. I am a Yankees fan and so is my dad. My grandpa (my mom's dad) actually didn't like the Yanks, but we think he secretly did. He watched every game and would always complain about them...and we think it's because deep down he liked 'em! One of the coolest things in my collection is my grandpa's "TV Brick" - it's a foam brick and he wrote on it: Throw at TV when yankees win. My father wasn't a baseball fan at all. I was all alone in that respect. I was a Yankees fan, which is part of growing up in Upstate New York. However, as a father, I have failed to pass my love of the Yankees down to my daughter. Instead, she's a fan of both the Red Sox and the Rays (local team). I can at least be satisfied that she's quite a baseball fan. I am a Mets fan, but my Dad is a Yankees fan. My father was never much of a baseball fan, but he took me to Tigers games and taught me how to chant Looooouuuuu. My parents are not baseball fans. AT ALL. 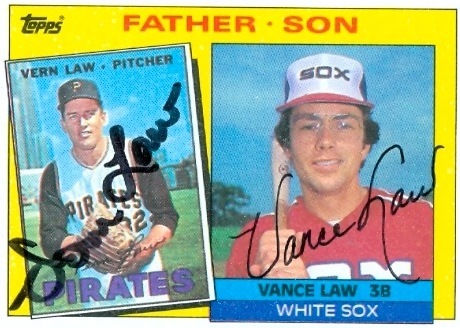 If there is a such thing as an anti-baseball fan that would be my father. He has been to baseball games though. He was born just outside of Pittsburgh and spent most of his life there. So if he had to pick a team it would be the Pirates. Anyone who has visited my blog is well aware of my favorite team is the Cubs, and my father's favorite team is the Twins, hence me being the only blogger I know of with a Kent Hrbek Collection. My father is a Yankees fan while I am a Mets fan. I grew up a Yankee fan hence my love of those great teams from the mid to late 70's. I have stated many times on my blog how I am a mets fan who also likes the Yankees second, I just am not a big fan of most Yankee fans. My dad doesn't really care about baseball and I am a giants fan, but the rivalry in my household is that my dad is a 49ers fan and I'm a rams fan. How did I not know about this blog? Seriously! I'm putting together a type collection myself. I am a Giants and A's fan. I think I was a Braves fan while I was in Georgia because, well, I was in Georgia and had no other teams to follow. Plus I moved there right after their worst-to-first move, which made them worth following. When I was younger (about 12 or so) I was a big A's fan, and my mother liked the Giants. What did that mean? 1989 brought a fun World Series rivalry, and my team beat the pants off my mom's team. Just like they did this weekend. I grew up a Yankees fan because of my dad, but as with most things, I decided to go down my own path and eventually became a Cardinals fan around about the time of the 1985 Series. My dad hates baseball but my mom is a Red Sox fan. Naturally, I am a Red Sox fan! We lived in Minnesota for a couple of years after I was born. 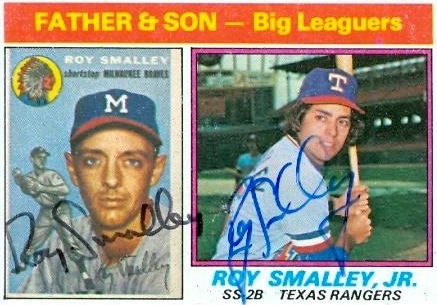 My father remained a closet Twins fan for years even though we cheered on the Rangers together. He passed away a few years ago and never got to see the Rangers in the World Series. I've passed on my love of baseball and the Rangers to my son and was fortunate to be able to take him to Game 4 of the Series last year. Here's the link to the blog pub. Thanks Matt! I was the only kid in NW Florida who wore Yankee pinstripes (#23, naturally) to elementary school at least once a week. I had an easy monopoly on all Mattingly cards amongst my friends who gladly traded for other, more local & nearby franchise players. My love for the Yanks came from my old man, though. He had grown up in northern VA as a big time Yankee and, more specifically, Mantle fan. So there you! I am expecting the birth of my son any day now - you can rest assured that his crib bedding has a nice, clean, dark navy-blue strip along the dust ruffle. My wife couldn't hide her disbelief when I passionately voted for which linen pattern I liked......it's all in the details, right? I'm a Reds fan first. My Dad likes them too but is primarily a Cubs fan. My parents took me to Cincy in the late '70s as Dad was so frustrated with the Cubs at the time he was taking a break. We went to Riverfront a lot and then to Tiger Stadium (so we're both also partial to the Tigers). My 88-year-old grandpa is a lifelong Cubs fan who still tells me about listening to the '45 World Series. As a matter of fact, just got to watch the Cubs-Yankees on TV with him last night! My other grandfather - dearly departed - lived in Ohio and was a Reds fan too. My fav team = Yankees. My dad's fav team = Mets. This was just the second Fathers Day that's passed since my father died. He was a Yankee fan of the Joe Dimaggio/Allie Reynolds era and I began watching the game with him at about the age of 5 or 6. By the time I was 7 we were regulars at Yankee Stadium, usually those Sunday doubleheader dates. I was an independent little cuss and always pretended to root for whoever the Yanks were playing. My Dad encouraged me to follow my 'hometown' team which was the Orioles (I was born there) and, after a brief flirtation with the Phillies, the Birds were 'my' team. They've been my team for over 50 years now even though I don't follow the current major league action much. I've been collecting the 1959 Topps set over the last year, at least in part because it brings back a lot of memories of the days I shared as a fan with my father. Hard to imagine how different life would be had my father not been who he was. I hope that my kids (the last two are about to graduate from college) can look back someday and think that way about me. That's my goal. My father's and my favorite team were both the Yankees. When he was growing up, they won so often he would root for them to lose sometimes just to make it more interesting. When I was a kid, I was the only Yankee fan in my class because the Mets were the hot team. So if not for my dad I could have been doomed to be a Met fan. Entered yesterday and plugged today. My father was a die hard Cubs fan but he past away when I was 8 and so did his influence on me. My whole neighborhood used to play sports in accordance to the season outside. During the summer's, we'd be playing baseball and everything would stop so the Cubs fan's could go watch the game on WGN. I never wanted to stop playing so I grew to hate the Cubs. I stopped watching baseball all together after the strike in 1994. A few years later, when I started watching again, I grew to love the White Sox. And have ever since. My mom tells me that one day I'm going to wake up and my dad is going to be standing at the foot of my bed, in full Cubs gear with a disappointing look on his face. I plugged your contest as well. My dad's a Red Sox fan. Used to have a framed photo of Ted Williams in his office at work. Everyone in my family roots for different teams. The only thing we have in common in the rooting category is that the Yankees are insufferable. My old man grew up a Senators fan. When they left he followed the Orioles just to get his baseball fix but would always talk about the Sen's. When D.C. got a team again he jumped the O's ship. I on the other hand will continue to sink with my birds. My dad doesn't really have a favorite team, I suppose he'd say the Jays if you asked but he's not much of a baseball fan. I was smart enough to jump ship with my dad when the Nationals came back to DC in 2005 (see Kirk's post above), and am an avid Nats fan these days. I did grow up an Orioles fan and still have a faint fondness in my heart for them. Hi my favorite team is the Angels! both of my parents are life long Phillies phans they were born there and still live in the area. Thanks cool contest.